Here are the average capacity factors of every Danish offshore wind farm, newly updated to include data to the end of 2018. 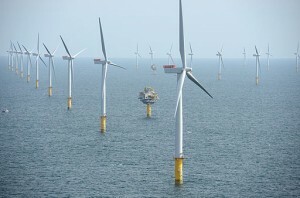 Compare these with the capacity factors for German, and UK, and Belgian offshore wind farms. 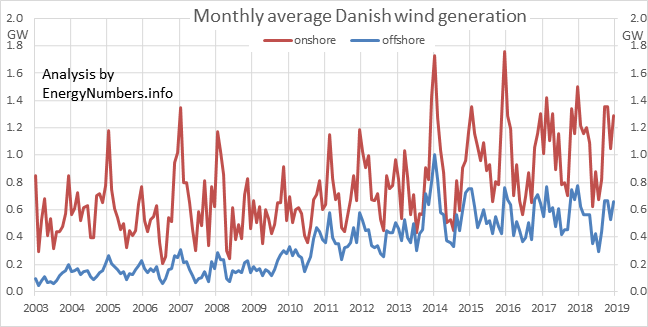 Previously I’ve provided the figures for Danish offshore windfarms, for the UK , and for Belgium too. Here are the numbers for the larger German offshore windfarms. The ones shown here are the only ones I’ve been able to get detailed data for, so far, and my main source is no longer freely available, so updates here will be very limited. If you know of additional data sources, please let me know on Twitter. All numbers are to the end of August 2018. Analysis by EnergyNumbers.info. I’ve constructed for each of the offshore windfarms for which there is detailed hourly data. Use the pause and play buttons to stop and start the sequential display of curves. Click on the windfarm name in the legend to toggle the display of that farm’s curve. Note that for each individual windfarm, its curve is based on data starting from the date that the windfarm was fully commissioned, and the windfarm’s age is calculated as starting at that date. There is one exception: the Bard Offshore Windfarm was fully commissioned in August 2013, but detailed data on its generation is only available from spring 2017 onwards – so the “age” shown for this windfarm is the age of the oldest available data, not the age of the windfarm itself. The numbers for DanTysk did look strange: I had to clean a stretch of five months of data that was clearly wrong. A small kink remains in its load duration curve; this may be an artefact of a small amount of remaining problematic data. Windfarms less than a year old are excluded from the calculations of the power density per unit area spanned. The figure for total power density is a weighted average of the windfarms that are a year older or more: this is weighted by size, but not by time. So a windfarm that’s twice as large contributes twice as much to the total; whereas a windfarm that’s twice as old, does not. There are two windfarms being built right now near the mouth of the Humber Estuary: Humber Gateway and Westermost Rough. Here’s a map of the ships serving the windfarms. 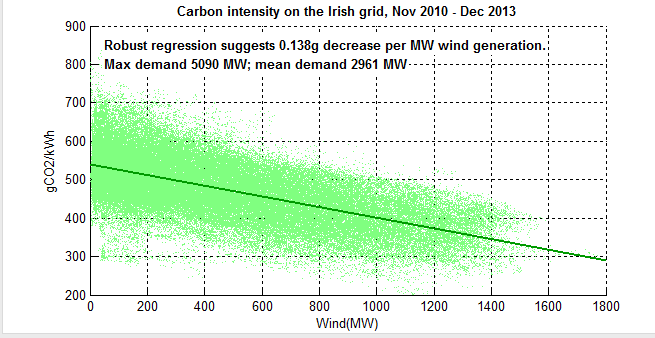 Following on from this question on the Sustainability Stack Exchange about decarbonisation in Eire, and a discussion on the Claverton Energy Group about the British and Irish grids, I took a quick look at the data on carbon intensity and wind generation in the Irish grid. This uses all the available data at time of writing – 38 months, from November 2008 to the end of December 2013. Here’s the impact that its wind generation has on the carbon intensity of the grid: each MW of wind power that’s generating, reduces the carbon intensity of electricity by 0.138 gCO2/kWh: 1GW of generation reduces the carbon intensity by 138 gCO2/kWh. For context, average demand is about 2.9 GW, and peak demand is about 5 GW. I’ve used Robust regression, as there are some reporting errors in there (further cleaning has refined the estimate to 0.136 from 0.138). The y-axis is baselined at 200 gCO2/kWh, because there’s very little real data below that line at present. I note that Eirgrid has heat-curves for every thermal plant on the grid (which is how they calculate the carbon intensity). Does National Grid have anything like that for GB? Do you? Would you like to share them with me? And re the data-cleaning – just in case anyone else downloads the wind forecast and generation data, note that every year on the last Sunday in October, the wind data for each of the four quarter-hours when the clocks go back is duplicated. And back in October 2009, I said the same thing at the Claverton Energy Conference. Anyway, enough of the source of this: let’s look at the numbers. 2011 was something of a boom year for Saudi Arabian energy production. The Arab Spring uprisings resulted in reduced output from other countries, meaning Saudi Arabia could significantly boost production without trashing the oil price. So let’s use its 2011 production as our benchmark. From the OPEC Annual Statistical Bulletin 2012, and converting from millions of barrels of oil per year into gigawatts, and from millions of cubic feet of gas per day into gigawatts, we see that Saudi Arabia’s annual rate of energy production was just under 800GW. By comparison, in 2011, UK average final electricity demand was 36GW and total final energy demand (including all gas for heating, and all transport fuels) was 183GW. So, as the chart above shows, the UK’s annual average offshore wind resource is somewhere between 1.5 times larger, and 11 times larger, than 2011 Saudi Arabian energy production. And the great thing is that the wind won’t run out. It will vary, at all scales from seconds to decades, but it won’t run out as long as the sun keeps shining. My own earlier estimate (shown above as Smith 2011) of over two terawatts as the UK offshore wind resource is documented on the Claverton Energy website. Using the same method as described there, and considering all UK waters, the resource is given above as Smith (2012). Stuart Gatley, in his Masters of Engineering thesis at the University of Nottingham, models a range of potential future scenarios both for turbine density and turbine technology. His Scenario A-T1, assuming current technologies, is given as Gatley 1 above; whereas Gatley 2 is his Scenario C-T5, which assumes advances in turbine technology and the opening up of all UK sea depths as accessible to wind. Giorgio Dalvit, in his Masters thesis “UK Offshore Wind Source”, produced a set of estimates, for different constraints. His estimate for the resource at less than 200 metres depth, and within 200km of shore, is given above as Dalvit 1; his all-area resource is Dalvit 2. 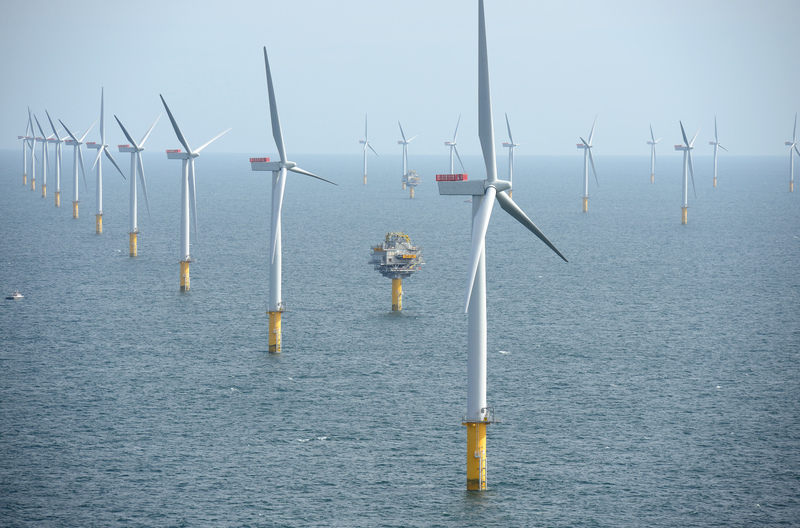 Why are there such different forecasts for the UK offshore wind resource? Because each analysis uses different assumptions. And they each use a different estimation method. Though, notably, they all use the same underlying data set: the Renewables Atlas. A future paper (being written now, in Summer 2012), will set out the different assumptions for each figure, and propose a new protocol for such assessments. The DECC 2050 calculator is a good start at producing a toy model to give some ideas of the trade-offs, and approximate orders of magnitude of costs involved in converting Britain’s energy systems into a low-carbon system. Added a new option to change the amount of fossil-fuels (coal, gas, oil) extracted in the UK. This option exists in the DECC spreadsheet, but wasn’t previously available in the web interface. Added a whole new section with performance against national and international targets. In the top-left corner of every page, you’ll find indicators showing progress against targets. Click on them to read an explanation of each target, and how well the selected pathway performs against each. Markets that exclude the impact on natural capital are distorted. Markets that exclude the costs of pollution are distorted. Markets that allow the Tragedy of the Commons are distorted. These distorted markets represent economic efficiency, and leave us all worse off. The polluter-pays principle corrects the market distortion caused by unpriced pollution. Joint-stewardship agreements allow us to sustainably manage common resources, preventing the Tragedy of the Commons. Tracking changes to the value of our natural capital base is just as important as tracking transaction values: both represent changes to our wealth. The Green Economy, in all those forms, is here because it fixes problems that have been accumulating for decades. Why the Green Economy? Because in the long run, the Green Economy leaves us better off, environmentally and economically. The Green Economy is worth hundreds of billions of pounds (euro / dollars) each year; it spans many sectors including the most fundamental ones of energy, food and water supplies; and in the last fifty years, it’s gone from fringe to mainstream, growing in value and coverage each year. For example, in 2011, global investment in renewable energy was US$257bn; and there are electric cars on the market that can out-run a Porsche. But the Green Economy has been around for quite some time, and its academic foundations, in the “polluter-pays principle” dates back to the early decades of the twentieth century. However, more recently, the problems have become global in scale, and the solutions have required international co-operation, for example in banning the industrial production of some of the worst ozone-depleting chemicals. The next wave of problems and solutions dwarfs what has gone before, requiring revolutionary changes to how we generate electricity, how we heat our homes and offices, how we power our transport systems, how we manage our livestock and fertilise our crops. The economic risks (and opportunities) are orders of magnitude greater than what has gone before. Today, at the 2010 BIEE conference, I’ll be presenting a paper on how Denmark manages its wind variability, and some of the implications for its target of delivering 50% of its electricity from wind by 2025. By 2008, Matilda was the world’s most productive wind turbine, having generated 61.4 GWh of energy by the end of its life. Is that what you’re asking? Is it? It’s part of the standardised SI system of units understood around the world, and it enables numbers from different countries and different times to be compared. Standardising on one unit of power makes a lot of sense. That is what the SI system does. Switching between mtoe/y, mboe/d, TWh/y, EJ/y, quads/y, kWh/d is a pain – I guess we all agree on that. Recently, commentators have suggested that the German experience of providing feed-in tariffs to subsidise photovoltaics [PV] has been a Bad Thing, but much of it is based on a flawed study from the RWI think-tank . Before we had lots of natural gas, nitrogen fertiliser was produced using the Haber-Bosch process. In our low-carbon future, we’ll be making use of it, or something like it, once more. It uses Hydrogen and Nitrogen with energy and an iron catalyst to produce ammonia, which can then form the basis of nitrogen fertilisers. And this process will be of assistance in the move to decarbonise. We can build coastal energy-intensive plants, right on the transmission network, for example at the points where offshore wind farms come ashore, and just operate them when energy is the cheapest. This would help balance demand and supply, at those times when electricity production from wind, wave, tidal and solar energy is highest, and at the same time it helps decarbonise the agriculture sector.